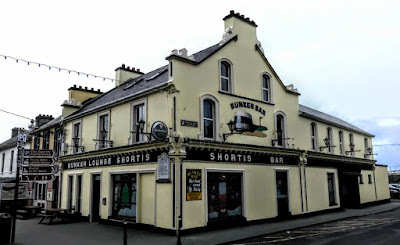 Ballybunion does not have the same heritage of stucco-decorated pubs and shopfronts, such as Pat McAuliffe’s wonderful stucco work in Listowel and Abbeyfeale. 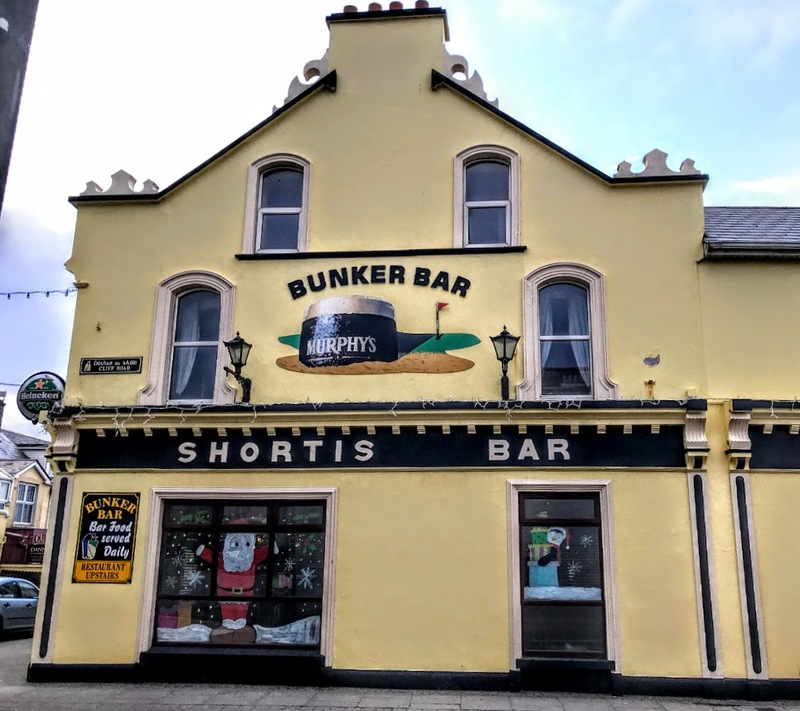 But Shortis Bar, also known as the Bunker Lounge, is one of the many attractive pubs from the same period, and stands on the corner of Main Street and Cliff Road in Ballybunion. This end-of-terrace, three-bay, two-storey house with a dormer attic, was built around 1890 by William Shortis (1869-1905), and has a two-bay two-storey side elevation to the east. William Shortis was born in Carrick-on-Suir, Co Tipperary, in 1869, and came to Ballybunion around 1888 and worked for about a decade as the Ballybunion station manager on the Listowel & Ballybunion Railway (L&BR). This unique, nine-mile monorail ran between the two Kerry towns from 1888 to 1924, and was known affectionately as the Lartigue, after its French inventor, Charles Lartigue. Shortis was a founding member of the nearby Ballybunion Golf Club in 1893, and he built Shortis’s bar and lounge around this time. Like many pubs of the day, the premises included a general shop, selling everything from groceries and hardware to shoes and clothing, as well as coal, iron and oil, and William Shortis also exported salmon to Harrod’s in London. William Shortis married Annie Brown, but life took a sad turn for the family in 1905. Annie, died in childbirth on 7 June 1905, and William died five months later on 12 November 1905. Local lore suggests he died of a broken heart, leaving five children with no parents. Annie’s sisters, Norah and Mary Brown, moved in to take care of the Shortis children. By 1911, the eldest son Patrick Shortis, aged 18, was a theology student at All Hallows’ College in Drumcondra, Dublin, studying for ordination to the priesthood. But five years later, Patrick Shortis died in the Easter Rising in Dublin in 1916. He fought at the GPO in 1916 and was killed with the O’Rahilly in an assault on the Rotunda. His brother, Liam Shortis, was a Republican prisoner during the Irish Civil War, but was released in 1924 and became an eye specialist. Dr Liam Shortis died in the 1950s. The pub on the corner of Main Street and Cliff Road in Ballybunion was renovated around 1930, and a render pilaster pub-front was inserted at the ground floor. The pub was extended to the rear to north in late 20th century, with the addition of a single-bay, single-storey flat-roofed return that has a dormer attic added. The shopfront has pilasters, decorative consoles and modillion cornice, and the painted rendered walls have decorative panels at the east gable end. Today, the bar is also known as the Bunker Lounge, which is appropriate considering the role of William Shortis in founding the Ballybunion Golf Club around the same time as he was building his pub and shop. I have been invited to speak at Lichfield Civic Society as part of its programme of public lectures for this year . Thursday 22 March 2018: Gareth Phillips, ‘The Hawaiian Islands’ (this meeting is being held in association with the Royal Geographical Society). Thursday 24 May 2018: Stephen Roberts, ‘Sir Benjamin Stone, a 19th century photographer of Birmingham’ (this meeting is held in association with the Historical Association). Thursday 18 October 2018: Danny Wells, ‘Cook’s Tours, The Achievement of Thomas Cook’ (this meeting is held in association with the Royal Geographical Society). These meetings begin at 7.45 p.m. in Wade Street Church Community Hall, Frog Lane, Lichfield. Non-Members are always welcome. Admission is £3, and free to members and school students.